Croatia has 8 beautiful national parks. While Plitvice Lakes National Park gets all the attention there’s another paradise on the water that’s just as fabulous: Krka National Park. It’s located along Krka River in Central Dalmatia and it was one of our perfect day trips from the lovely coastal city of Zadar. 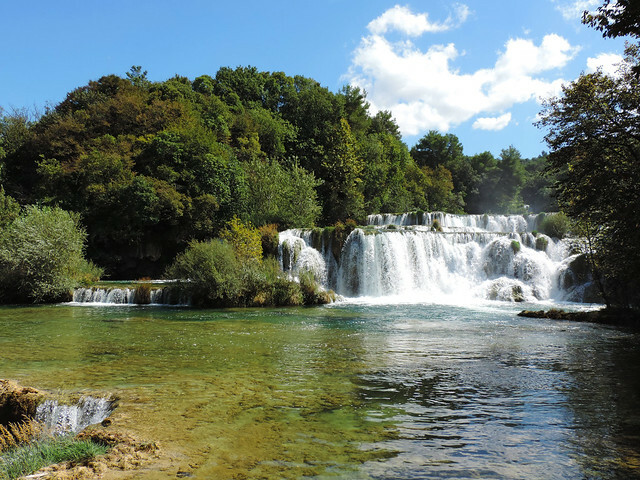 With its seven travertine waterfalls Krka River is an amazing natural karst phenomenon in the Dinaric karst region. Travertines (basically limestone that has settled out of the water) are not a rare sight there but they rarely build waterfalls. 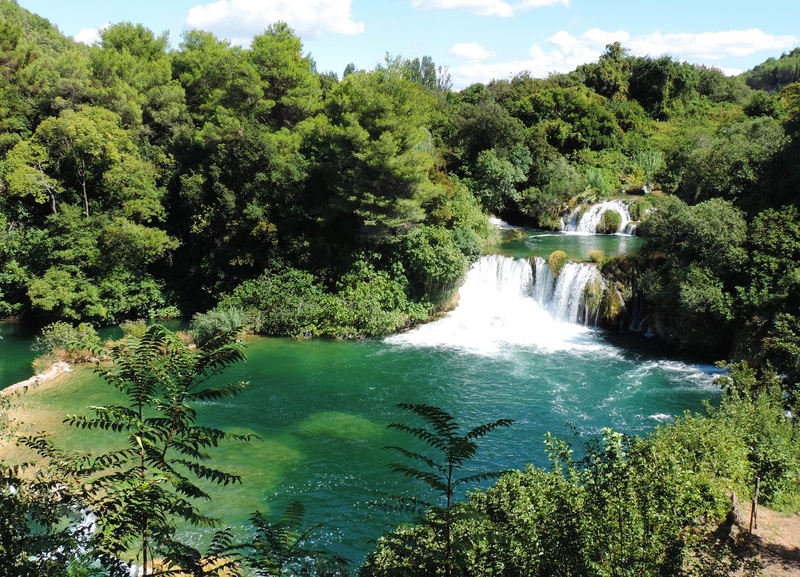 So the ones built on Krka River are not only very beautiful but also very valuable natural treasures. And it’s a place that every waterfall addict should explore! 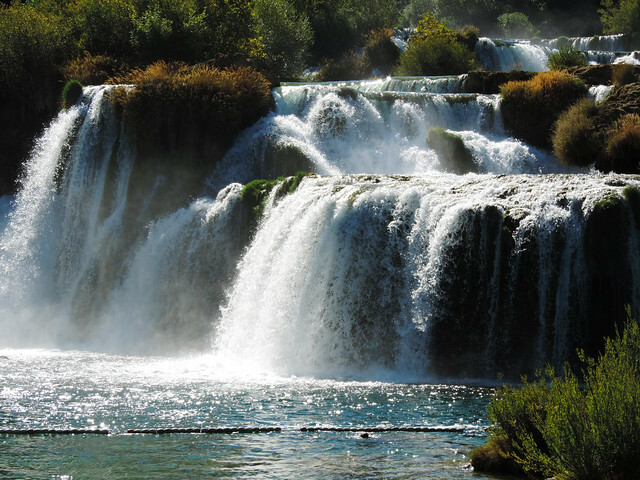 Krka was declared a national park in 1985 and several areas of the park can be visited by tourists today. 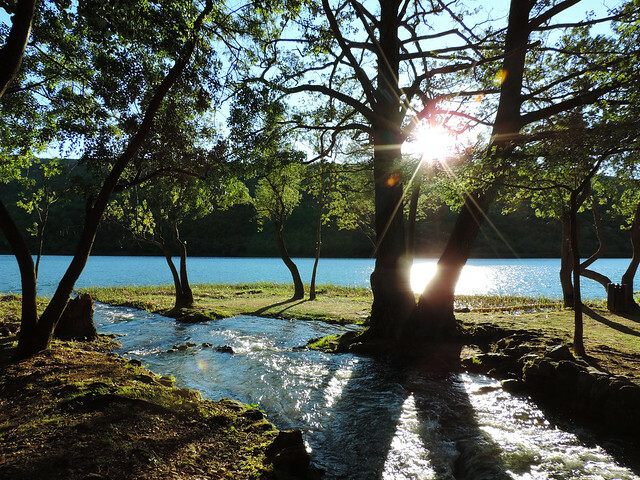 There are easy trails – partly on boardwalks – around the waterfall area and we could jump into the pools under Skradinski buk at the end of the trail to refresh ourselves. So Skradinski buk, the most famous sight in Krka National Park. It’s the longest of the waterfalls on Krka River – actually, it’s a series of 17 waterfalls with a vertical drop of 50 meters in total. 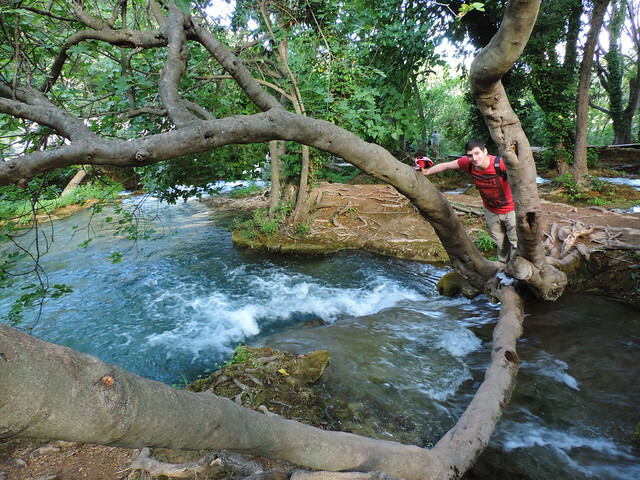 Its cascades are composed of travertine barriers, islands and lakes and it’s just so pretty! Especially when the sun shines and the play of light on the whirlpools makes it even more beautiful. There’s an easy trail that let us wander in the area around Skradinski buk and it offered several viewpoints of the falls from different angles. Then we enjoyed the crystal clear (and surprisingly cold) pools in front of Skradinski buk. 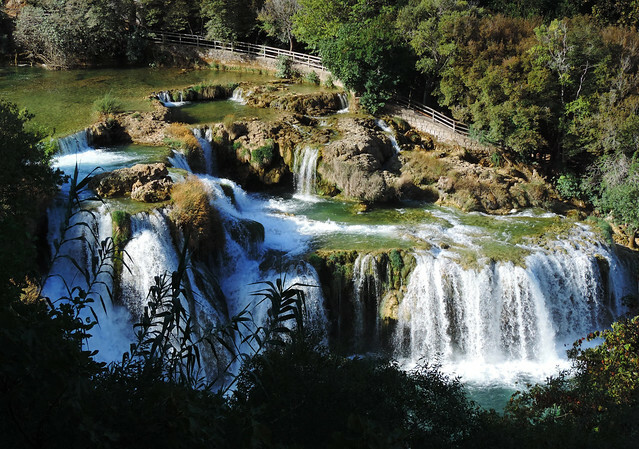 Skradinski Buk is the most well-known and busy area of Krka National Park but not the only one. We also visited the Roški slap area that can be accessed from a different entrance. Roški slap is a waterfall made up of a 22.5 meters high main waterfall and countless backwaters, cascades and travertine islands. In addition to the easy loop trail we ventured out on two of the short, steep trails starting from the area. 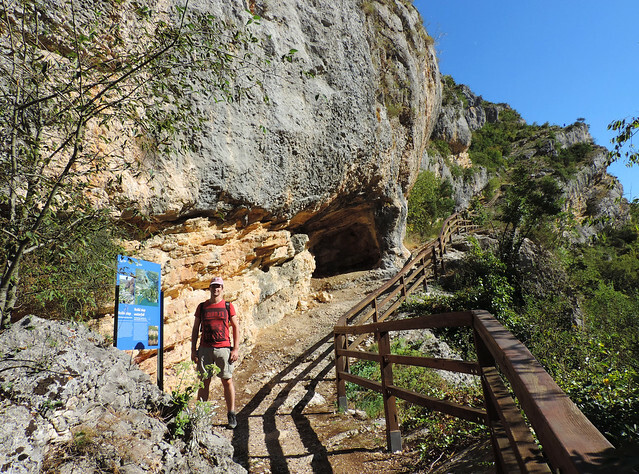 One of them led us to a stunning view over Krka Canyon and Krka River, the other ended at a small cave that hosted an exhibition about prehistoric times in the area. Then we enjoyed a peaceful evening walk at Krka River. 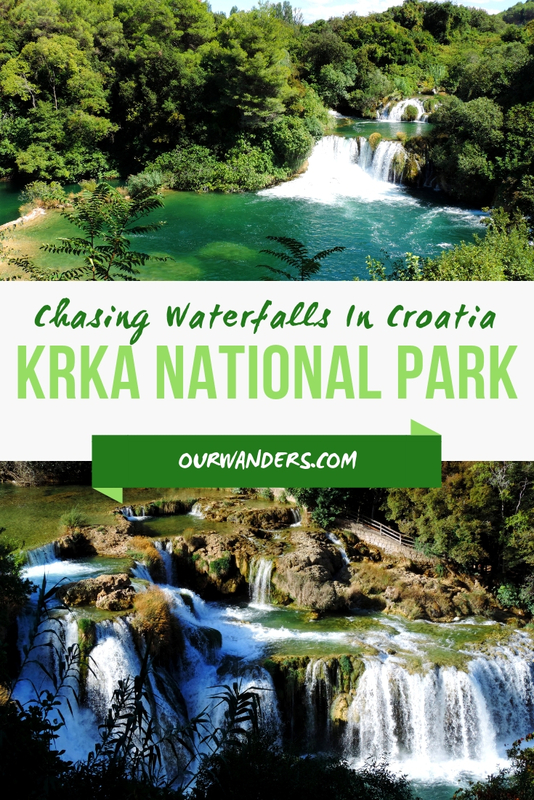 That was all that fitted into one day for us but the park has more to offer: Bilušića buk – another lovely waterfall that can be accessed by a short trail, Krka Monastery, Visovac Island or the remnants of the Roman military camp Burnum. 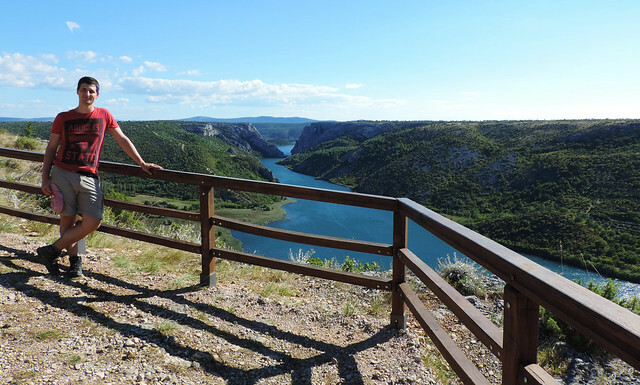 We could only recommend to explore Krka beyond Skradinski Buk as our getaway to Roški slap was a charming addition and it let us experience the solitude we would have never found around the busy main entrance. 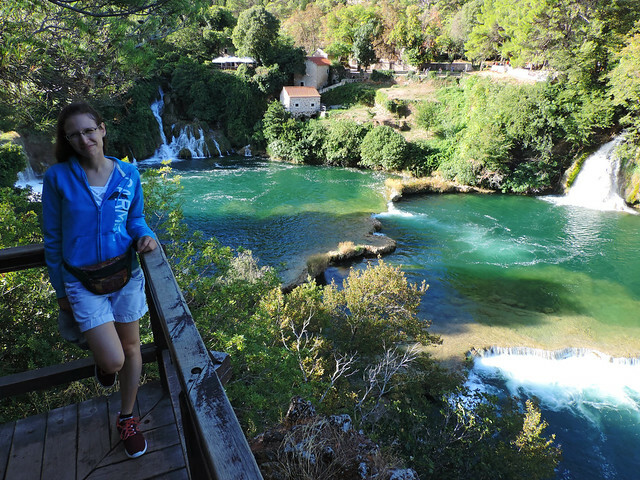 There are more entrances to the different areas of Krka National Park. We started our day at Entrance Lozovac that is the main road entrance for tourist buses and individual visitors. You can leave your car in the large parking lot and use the shuttle that takes you down to Skradinski buk (it’s included in your entrance fee). However we chose to walk down there – it’s a nice, short trail (not even a kilometer in length). In the afternoon we got back to the parking lot and drove to Entrance Laškovica that is the entrance to the Roški slap area. The road leading there is a narrow one but views are nice and signs indicate the entrance. We didn’t need to buy tickets there since we bought them for the day at the main entrance. But you have the option to buy them if this is the first area you visit in the park. If you prefer exploring Krka on water, there are excursions by boat from Skradinski buk to Roški slap and Visovac Island during the summer season. You can visit the easy trail around Skradinski buk any time throughout the year thanks to the boardwalks and bridges that makes it safe and easy to enjoy the captivating views. And for sure, it could be a fairy tale scene in winter. But our favorite time to visit it is when it’s all green and warm, the sun is shining, there’s a pleasant light breeze and it’s nice to jump into the pools for a swim. Of course, there’s no guarantee for those conditions any time of the year but late spring, summer and early autumn give you pretty high chances. Our choice is always early autumn when it comes to visit Croatia or other countries in the Mediterranean. Then it’s still summer there but without the summer crowds. Opening hours and entrance fee to the park varies throughout the year – you can check the official website for more info about hours and prices. Have you been to Croatia? Do you have a favorite waterfall wonderland in Europe?